44 pages.Volume 200, number 3. 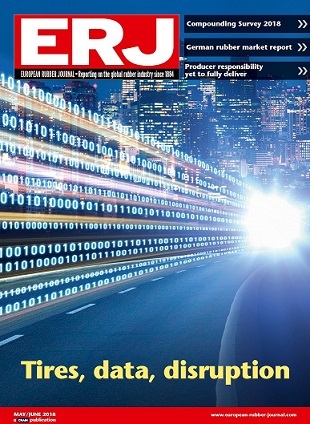 Title on cover: Tires, data, disruption. Features: *ERJ Compounding Survey 2018 *Facing disruptive change: VMI leader on how to survive and thrive in the era of revolutionary change that lies ahead for the tire industry *Forward thinking: Senior industry figures give their views on the way forward, ahead of this month's Future Tire conference at Tire Cologne *How RFID is transforming the tire industry *Bridgestone boss: Automation needs commitment *A look ahead to the rubber exhibition and IRC conference in Nuremburg. European Rubber Journal magazine has been reporting on the world's rubber industry since 1884. Published six times a year, the magazine provides details of all of the important commercial and technical developments within this business, one of the world's most dynamic and globally integrated industrial businesses.